For anyone who has ever watched an episode of ‘Clean Sweep’ or ‘Hoarders’ and experienced even a slight glimmer of self-recognition as you watched the people brave enough to go on those shows…this post is for you. It’s also for all of my teacher friends who know that teaching is not just a job…it’s a part of who we are. But. I’m having a really hard time. Letting go. I’ve changed jobs before. I’m actually one of those people who actively seek out new opportunities, and truly embrace change. But this time it’s different. Teaching is not just a job…it’s part of who I am, and as I close this chapter and finally move on, I’m finding it’s a lot harder than I thought it would be. Over the years, like any teacher worth her salt, I accumulated lots of great…well…um, err…teacher ‘stuff’. I’m not sure how else to put it. 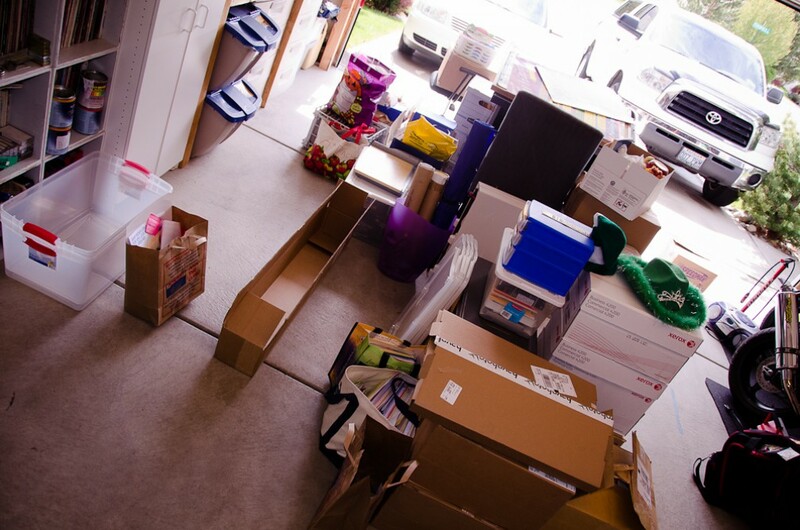 I’ve got 11 years worth of books, binders, lesson plans, posters, manipulatives, games, and who knows what else sitting in a huge pile in our garage. Now that our photography business is up and running, and I have a new ‘day job’ that keeps me out of trouble, I’ve come to the realization that the chapter in my life where I welcomed other people’s children into my classroom (and heart) has officially come to an end. I guess there was a part of me that didn’t have to accept this reality as long as I still had all of my ‘stuff’. Deep down, I know that this is the right decision for us, and I’m so looking forward to what this next chapter holds. But I’m a little sad too. I have so much of me wrapped up in all of the ‘stuff’ in our garage…so much time, energy, and great measures of hope and excitement went into the lessons that I created and taught to my kindergarten, and then middle school students. So, if you know a great teacher…and I know we all do…make sure that you go out of your way to give them a hug today. (I was always so appreciative of those who stopped to simply acknowledge the job that I was doing…whether they were strangers, friends, or parents who had students in my classroom.) Unless you’ve ever been a teacher, there’s just no way to explain the level of commitment it takes. Teaching is not just a job…it’s a part of who they are, and good teachers put more of themselves into their ‘work’ than any other group of people I’ve encountered. Every. Single. Day.